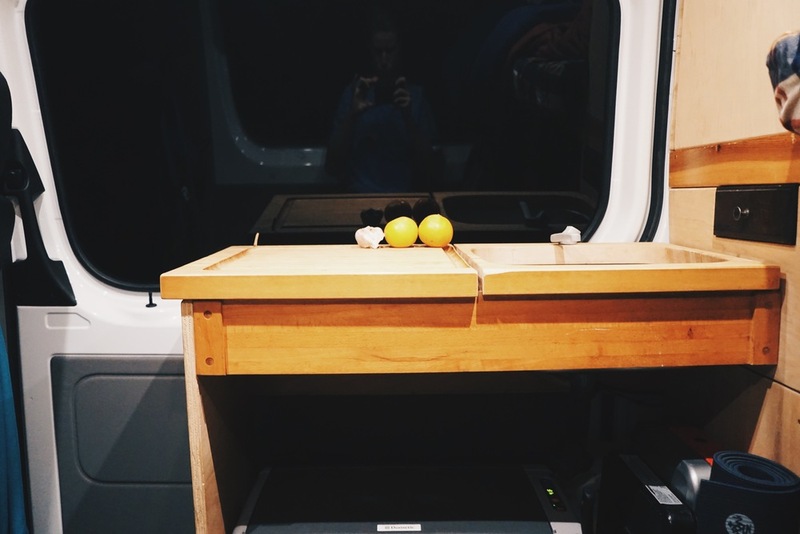 After spending the last 6-months splitting time living in our van and on our bikes, we're finally ready to share with you what our home on wheels looks like. 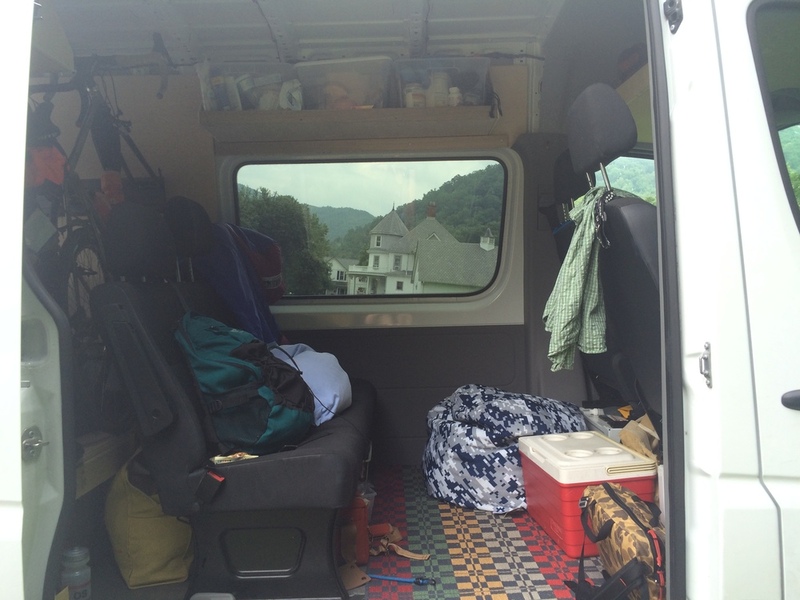 This is what our van life looks like. It's pretty stealthy if you ask us. Looks like a plain old white van. If you saw this puppy parked outside your house, on a side street in Portland, in a Rest Stop on the side of the Highway, or a Scenic Vista off of Highway 1, you would never guess that there is a whole world of fun inside and that two people and anywhere from 5-7 bikes rest comfortably inside. That's right! You can literally park anywhere with this puppy and it just looks like a parked car. Not only do you say goodbye to paying for motels, you say goodbye to paying for campgrounds as well. Motels do offer the convenience of showers, wifi, and bathrooms. Some campgrounds offer showers. 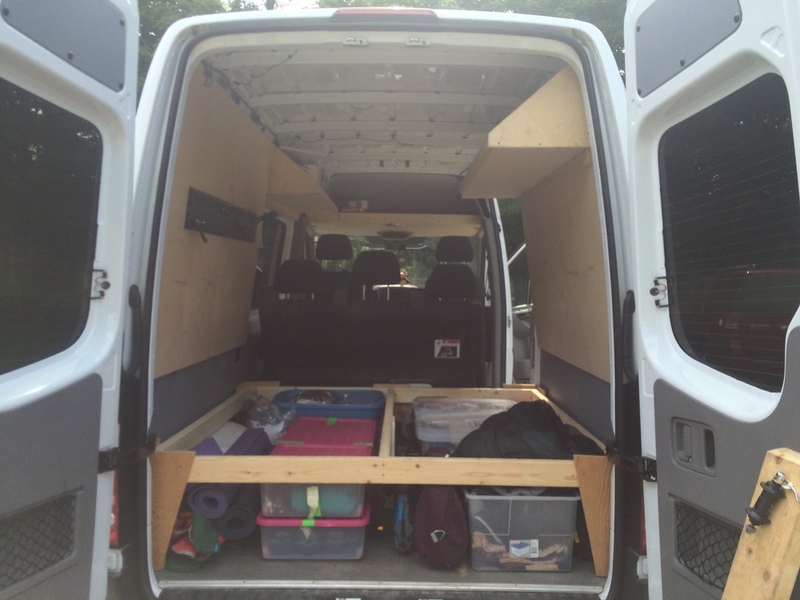 So we had to figure out how to get all those things with our van. So back to the question of how we get all those comforts of home from this little-big van. When we are in transit, we stop at Rest Stops and Scenic Vistas because they're convenient, sometimes scenic, sometimes have wifi, have water and most importantly have bathrooms. We sleep there overnight, refill our water bottles as to not drain our water tank too quickly, make some breakfast or dinner if needed, and get back on the road. One interesting experience we had parking and sleeping in the van was off of Highway 1 in California, just outside of Big Sur. It was very late at night and we finally found a big enough spot to pull the van off the road to sleep for the night. Technically, they don't want people to park there overnight along the 1, like Rvs and such, but our van is stealthy, it just looks like someone enjoying the Scenic Vista, right? We parked the van and hit the hay. Around 3 A.M. we hear a series of loud knocks on the van door, "POLICE!" Bright lights shining from all directions lit up the van's interior. We immediately woke up, startled and confused. "Dang! They caught us" we thought, for parking overnight. We stumbled around our messy van trying to find glasses and pants. We opened the door to the van "DEA" they barked, and we were greeted with five DEA agents dressed in civilian clothing. Maybe it was because we had just woken up, maybe it was because we had a tiny bit of pot in the car, maybe it's because we are from Ohio but if Tom's search for his wallet was any indication of how freaked out we were, well we were, freaked OUT! Upon seeing the couple of clumsy, unorganized, hipstery bike people, the DEA agents explained that we weren't who they were looking for. 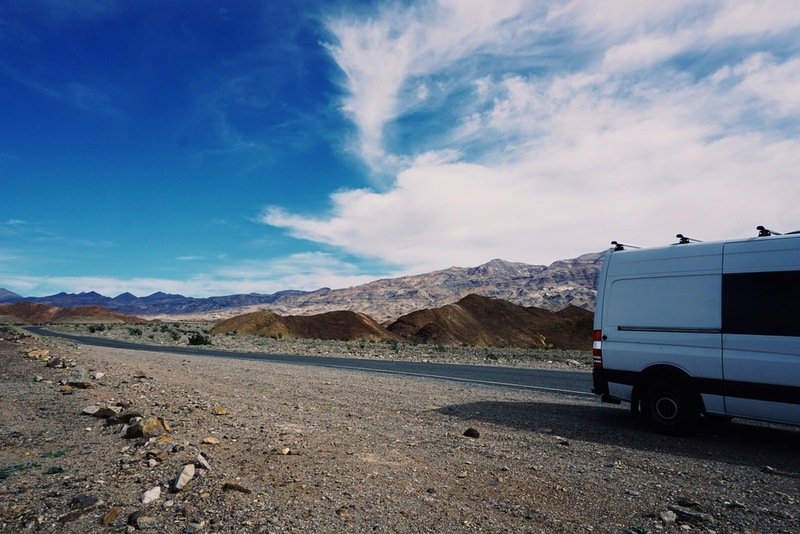 It turns out that it is fairly common for plain white vans with Ohio license plates to park along Highway 1 to wait for ponga boats transporting marijuana from Mexico to California, to take it to Ohio... We weren't the real threats. "We have better weed here anyway, they said" and got on their way. For $12 you can take a shower for as long as you want, towels, wash cloths provided, at any Flying J/Pilot Truck Stop. If you are a traveling couple, don't pay for two showers, just sneak into one, there is plenty of room. If you're finding that you like Flying J/Pilot Truck Stops for refueling your gasoline/diesel, then become a member! You accumulate points as you fuel up that go towards free showers. We also carry around a solar shower for those out in the wild moments. Flying J / Pilot Truck Stops have you covered! Also, most towns have laundromats, duh. There is no excuse to have smelly clothes. We've all been there with the overage costs on the data plan. If you want a $500 phone bill, drive across the country with google maps turned on. That'll do it. So the key is to quit using your phone data in the car. It's tough, take it from me, my data usage this month is 80%, Tom's is 20%. When you're in the car, you just want to gram, google, and stare at your phone. Here are some tips I've picked up to minimize the use of my phone data while on the road. - Purchase a GPS Device for navigation. It's safer, a lot easier to follow, will save you data, and will minimize conflict and stress between driver/co-pilot. - Pre-Download Podcasts in a wifi environment. Some of our favorites are Reverberation Radio, Radiolab, and More Perfect. - Take naps. If you are traveling a lot, you need your beauty rest, long car drives are a great place to catch up on some ZZZ's. - Get your wifi where you can find it. Coffee shops, Rest Stops, Libraries, friends houses. It's everywhere. Use it! We purchased our Mercedes Sprinter Van, 2500 high roof 144", back in 2014. We found ourselves driving further and further for rides, with more people and more bikes. Bike shop business was good and it was time to get some more space. Now Tom did a lot of research on this one. He has a passion for old vans and we considered buying used. After a lot of consideration regarding the services and upkeep, let alone the price, we opted for monthly payments on a new van with a 60,000 mile service package (which we just reached the end of). 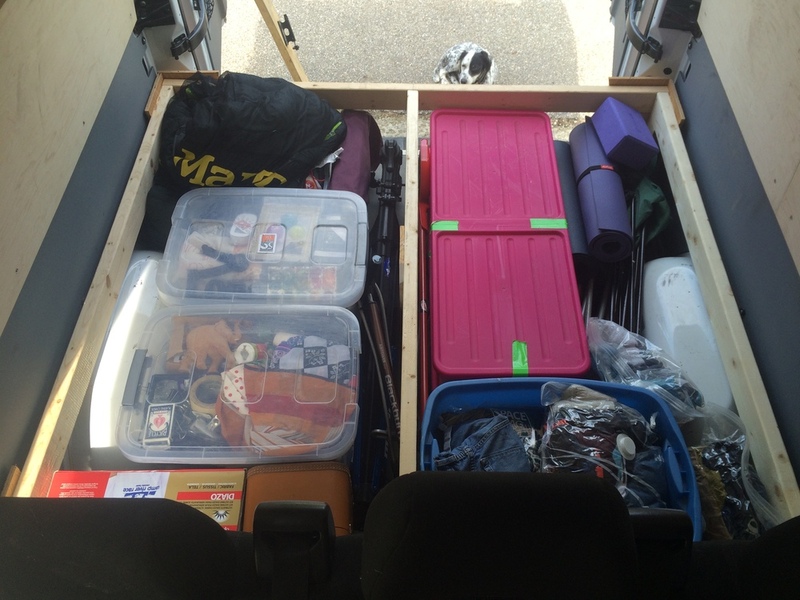 This set-up worked well for getting a lot of bikes and people in the van, but it came at a cost. It was an extreme hassle to pack. The subfloor made it more difficult to stand up and put the bikes on the rack and while the floor was removable, it required a tremendous amount of pack planning. Good luck getting anything under that floor after a few bikes were on the rack. Nowadays there is no bike shop and there is a lot more cross-country traveling and bike riding. We needed to be able to live/sleep in the van comfortably, we needed to carry a lot of bikes, while still carry a ton of camping gear, bike parts, and bikepacking gear as we would be leaving from the van for bikepacking trips. 2016 would be the year to make it happen. 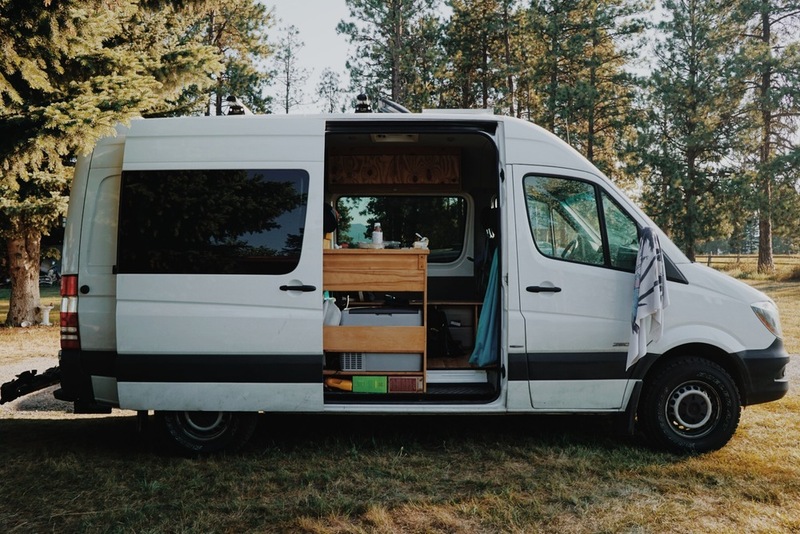 Fresh off of the Trans America Trail with a cross-country move planned, Tom set to work on the Van in the middle of January in Ohio (it just so happened to be the coldest two-weeks in Ohio that year). Insulation/Headliner - Roof Insulation: Roof/Reflectix/1" pink foam board/ Reflectix/Factory headliner. Wall Insulation: Reflectix then denim batting or pink board depending on suitability, sealed with plastic sheeting. Ventilation - Midship: Fan-tastic 3 Speed reversible with thermostat, Bed: Fan-tastic vent with screen, both vents are clear smoke tinted lids. 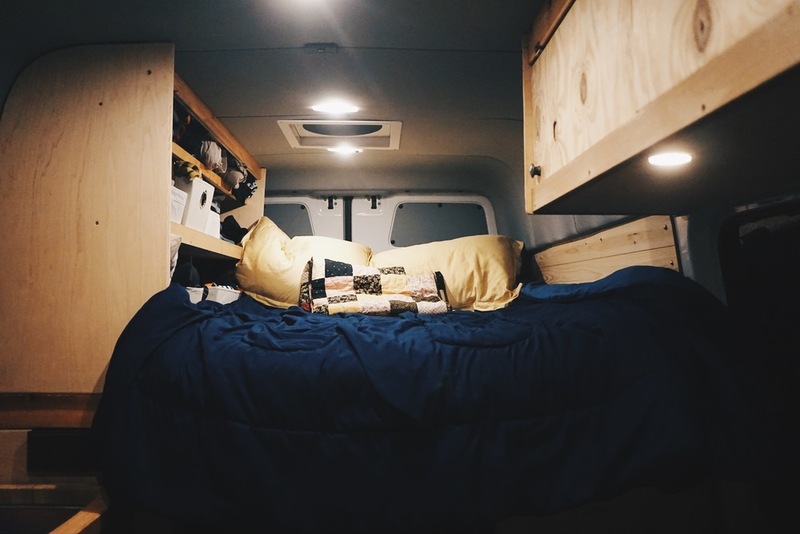 The fan is set to exhaust most times, which pulls air out of the van, with the doors and windows closed and the rear ceiling vent open, a nice breeze is pulled into the van directly over the sleeping compartment. Electricity - 12v 125AH AGM "house" Battery coupled to the Main battery with a Blue Sea ACR. The "house" battery is also charged by a 100watt Renogy Solar panel on the roof through a Morningstar PWM-15 Solar controller. We use a Prowatt Pure Sine Inverter for 110v AC items like big bike lights, laptops, etc. 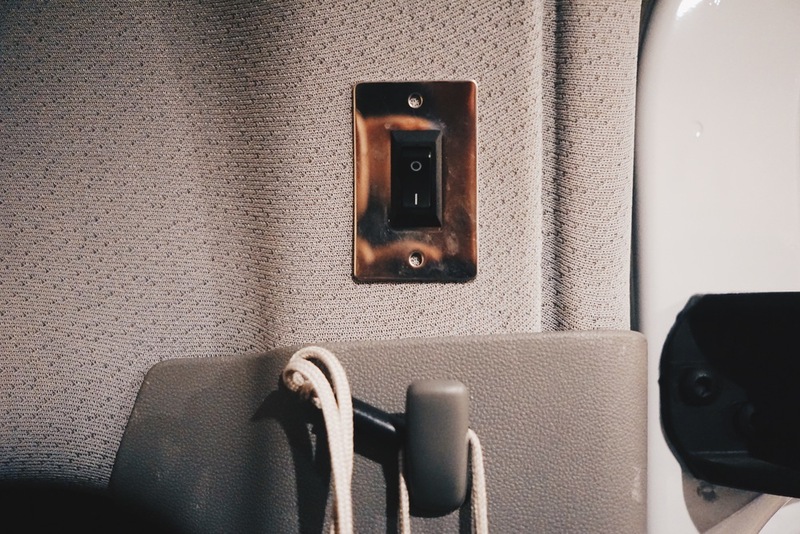 There are 3 switched pairs of LED lights to illuminate different zones of the van. Everything we use while stopped runs from the "house" battery, allowing the main battery to remain fully charged so the van always starts. Sink - Tub: IKEA less than $20, We only use the sink for filling bottles, could have been omitted. In lieue of more sophisticated plumbing, there is a MTB inner tube connected to the sink drain which can be run to the ground or to a catch basin. Bed - 4" memory foam pad on a 3/4" plywood deck sitting atop Uni-Strut frame. The frame is attached directly to the van body with Uni-Strut L-Brackets and 3/8" coarse sheet metal screws. Toilet - Plastic portable RV or camping toilet. Emmergency use only.